When I recently saw the movie “The Human Scale” on Jan Gehl’s impressive work in cities around the world, I was particularly touched by the scenes from Christchurch and the struggles between people and developers as well as local and national politics on the city’s future after the devastating 2010-11 earthquakes. As we’re approaching the third anniversary of the 2011 earthquake which killed 185 people, the question is whether this tragedy will turn out as an opportunity to build vibrant, livable places for people instead of repeating mistakes from the past and from other cities. 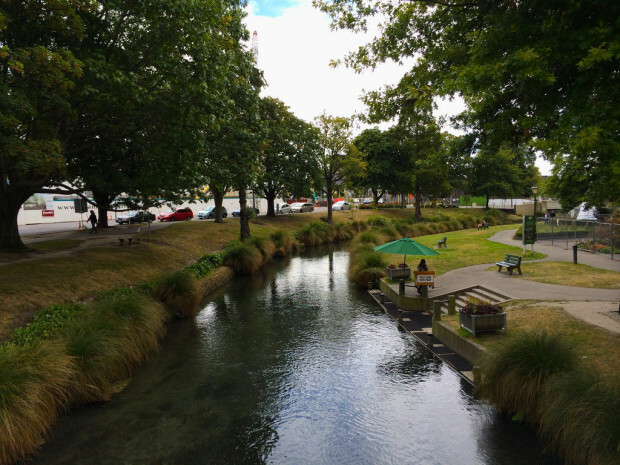 So, I was very impressed when I recently received an email from a friend and Urbanist in New Zealand showing that Christchurch is heading into the right direction thanks to many engaged and creative citizens. Enter Darren Davis, Principal Public Transport Planner at Auckland Transport who was in Christchurch for a few days to see the level of interim placemaking and tactical urbanism taking place as a way of activating the city centre where over 1,000 buildings – including 200 heritage buildings – have been demolished and the final demolitions are still taking place. “The eeriest thing about Christchurch are the places that got stuck in time when the big earthquake struck on 22 February 2011: The Town Hall advertising forthcoming events (which never happened) and cafes where the half-drunk cups of coffee are still on the tables. Christchurch is a giant experiment in city rebuilding with a city council that is well-intentioned but short of cash (not helped by the fact that the city was heavily underinsured for an earthquake that it never expected) and a national government in Wellington which seems to believe that building more and wider roads and sprawled suburbia is the way to go. The cost of reconstruction is estimated at $NZ40 billion but the human cost of the quakes is many, many times that. The city has been without a heart since 2011 and will only slowly come back to life, in the formal sense of new buildings and places, between 2015 and 2017 as the so-called “anchor projects” come on line. The absence of a heart to the city has created tectonic shifts in the urban geography over months that normally take place over decades. Sadly, a lot of this is people fleeing the devastated zones of the city for sprawled subdivisions in peripheral areas that are not prone to liquefaction. The long term cost of this will be increased social isolation, increased commuting times, and living in disconnected communities with lots of cul-de-sacs where driving is often the only realistic option for many trips. But the amazing thing about Christchurch, which my photos try to demonstrate, is the unleashing of creativity with non-conventional space activation in the city centre and other heavily quake affected areas, where there was often only vacant land and devastation. In the process, this is building community in ways that would be difficult to imagine without a catalysing event like an earthquake. 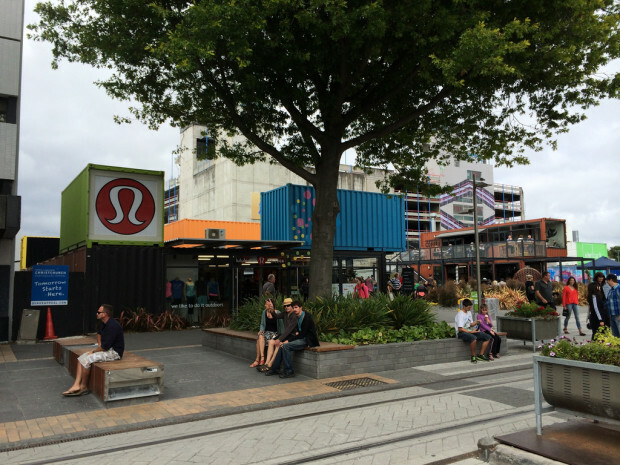 This creativity ranges from the Restart container mall bringing retail back to the devastated city centre much earlier than would have otherwise been possible, through to interim streetscapes and multiple community-led “gap filler” projects such as the Pallet Pavilion. Let me finally share some of Darren’s great photos which tell the remarkable stories that came out of this urban tragedy. For more photos, visit Darren’s Flickr set “Christchurch 2014”. 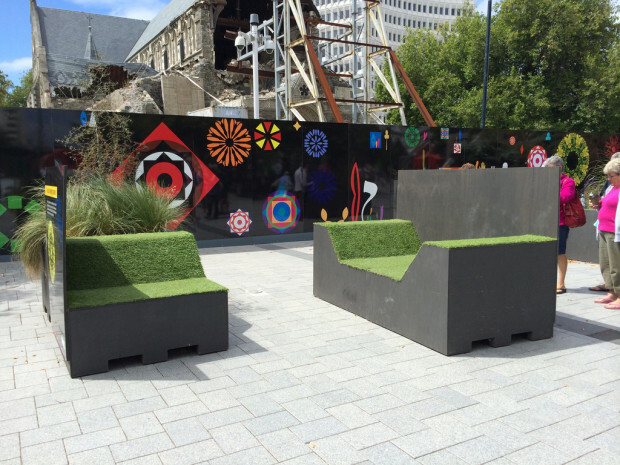 Transitional Cathedral Square Project: Artist Chris Heaphy has created a ‘’contemporary whare’’ that forms a visual link to the physical, cultural and spiritual life of Ngāi Tahu and to the Anglican Church, aligned to the entrance to the devastated Christchurch Cathedral. 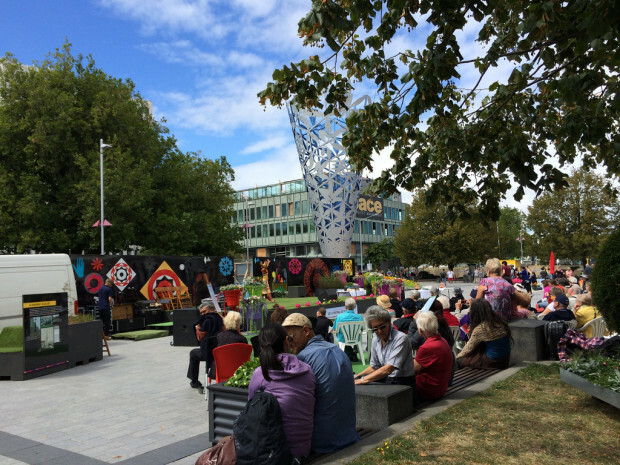 Christchurch City Council’s Transitional Cathedral Square project has brought people back to the devastated city centre with event and temporary activations. The hoarding murals are by artists Sara Hughes and Chris Heaphy. 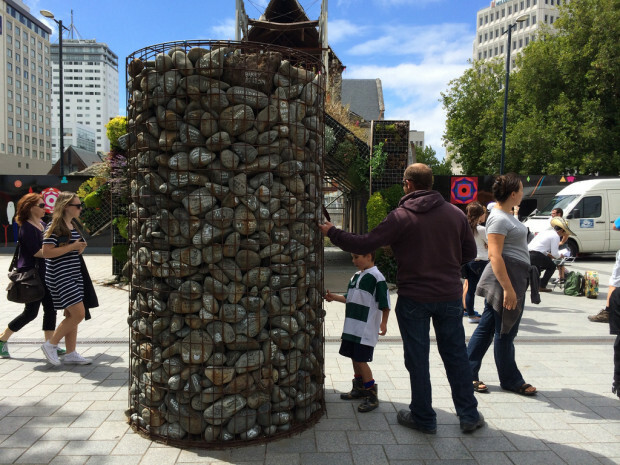 A rock cairn in The Square. Each rock has a message from someone to the people of Christchurch in the wake of the devastating 2010-2011 earthquakes. In effect, the messages on the rocks form a moving series of love notes to Christchurch. 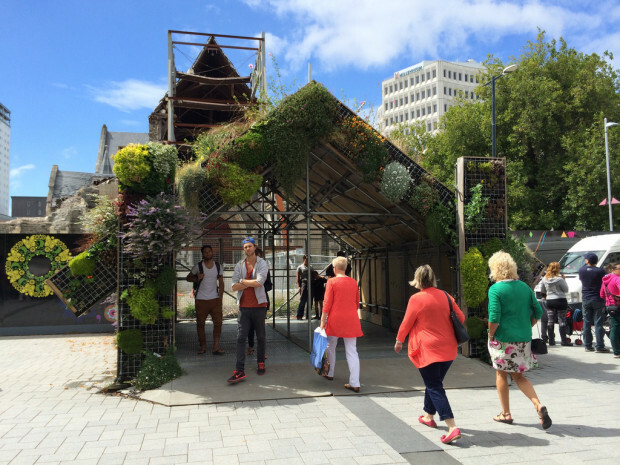 Adjacent to the Christchurch Cathedral, heavily damaged in the February 2011 earthquake and now partially demolished, the Festival of Flowers created a pile of useable tactical urbanism interventions to activate The Square. The Restart Mall has replaced the traditional bricks and mortar retail on the main shopping street of Cashel Mall with a container mall full of local, regional, national and multinational retailers. 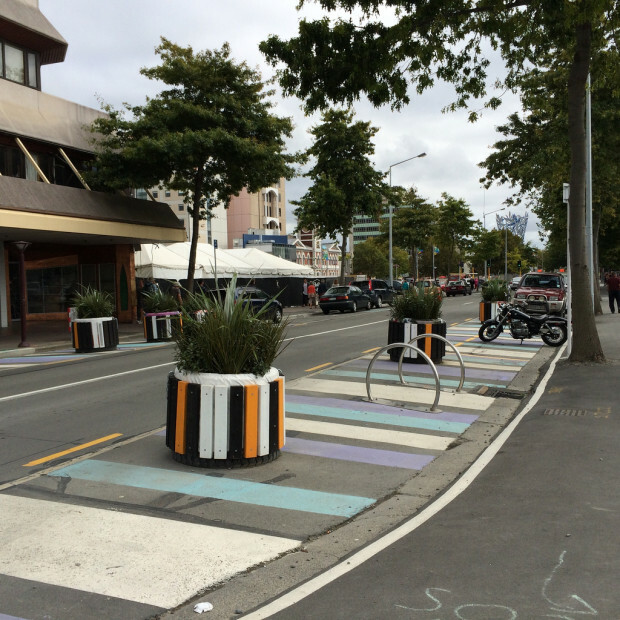 Christchurch City Council has created a temporary streetscape in Colombo Street, the main north south street, to reinforce a 30 km/h speed environment, to make the space more friendly to pedestrians and cyclists and to support the revival of the city centre. The Pallet Pavillion is undoubtedly the flagship gap filler project done by the community, for the community. 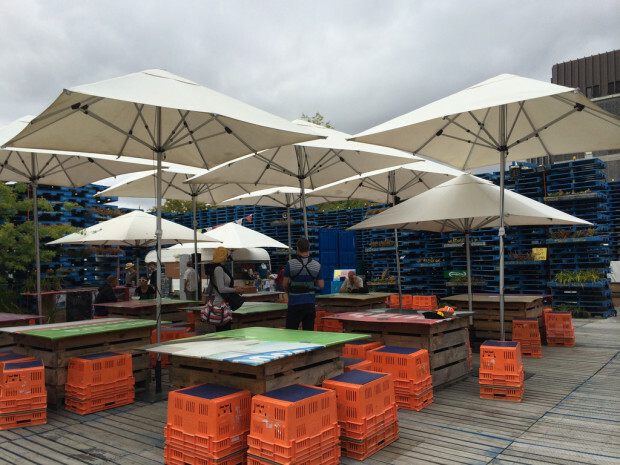 Made up of a space enclosed by blue painted pallet, it is a venue for an enormous range and diversity of events and activities. 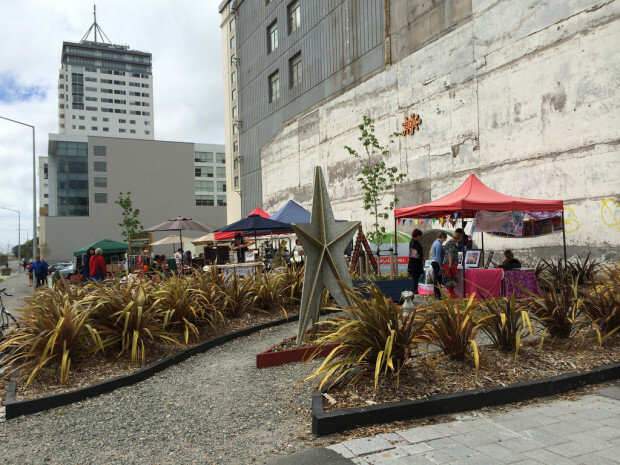 Weekend market as part of the Sound Garden Gap Filler by Life in Vacant Spaces. 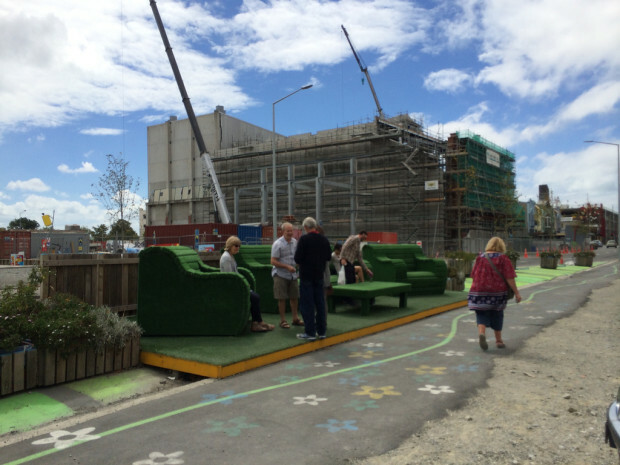 Parklet, part of the “Greening the Rubble” relocatable park on Gloucester Street adjacent to the Sound Garden. 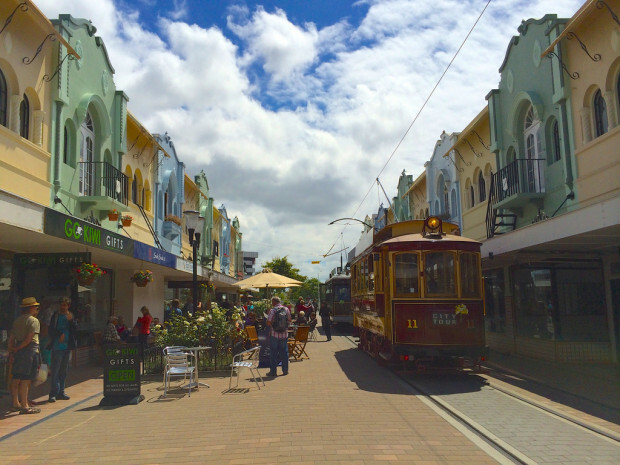 New Regent Street is one of the first retail areas to reopen in Christchurch city centre since the earthquakes of 2010 and 2011. Service on the Christchurch Tramway was restored in October 2013 on part of its route linking New Regent Street to the Canterbury Museum via Cathedral Square and Worcester Street. The first stage of the Avon River restoration project has put native rushes and other plantings in an area formerly exclusively the preserve of exotic species as part of a large-scale riparian restoration project. 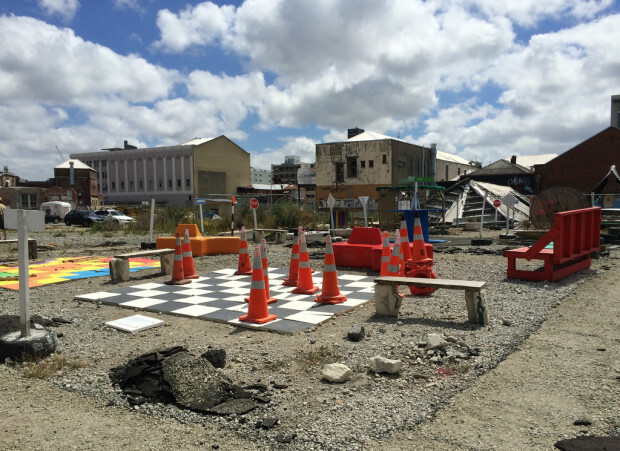 Chess board with pieces made up of road cones, ubiquitous in Christchurch in the rebuild phase. 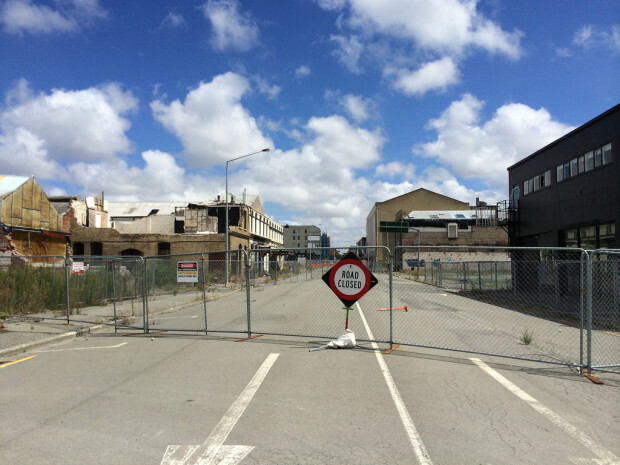 While much has been done to activate parts of Christchurch’s devastated city centre, it is an undemiable fact that the sheer scale of the devastation – with over 1,000 buildings already demolished, including over 200 heritage buildings – has irreversibly changed Christchurch. P.S. 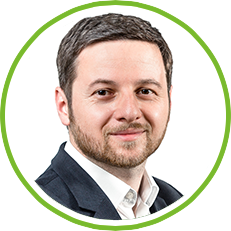 : You can also follow Darren on Twitter: @DarrenDavis10. For more information on these placemaking and activation innovations, visit the projects’ websites: Gap Filler, Life in Vacant Spaces, Pallet Pavilion, Restart Mall and Transitional City. There are profiles of a huge range of cool projects on these websites with heaps of good ideas that could be readily replicated elsewhere.